ON the GO! We know how your toddler loves to WIGGLE n MOVE...In our classes, Movement is the key to learning music...so let's JUMP UP, WIGGLE, PLAY n GROW! Unlimited Classes in SB and Goleta to attend at any studio, any day, afternoon, weekend or night! Toddler Families can attend any Toddlers, Friday Yoga, Family Time and Music w/ Seniors classes for their Unlimited Subscription value of $70 a month + $30 for At-Home Music kits. Siblings 50% off! 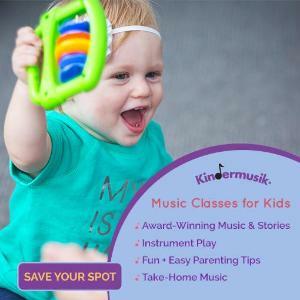 Toddlers 1-1/2 to 3-1/2 years and their parent or caretaker is a music class that celebrates the unique joys of your growing and curious child, while nurturing their Brain, Body, Heart n Soul thru Music...All in the key of LOVE! Each week your child will love singing, dancing, and playing instruments with you and her new friends, and you'll love helping them practice brain-body skills and a wide variety of abilities such as gross and fine motor skills, turn-taking, social skills, and active listening!